Old Stan: Hey, Stan, do you want to go upstairs and play hide-and-seek? Stan: [rolls eyes] Hide and seek? Mr. March: Yes, Stan, you should go up and play with yourself. Q: Is "marijuana" a real or fictional drug? 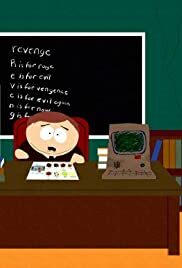 Q: Who threw away the "marijuana" joint found by Jimmy Vulmer, Token Black, Craig Tucker, Clyde Donovan, Kyle Broflovski, Eric Cartman and Stan Marsh? Q: Is "Ecstasy" a real or ficional drug? My Future Self N Me is a very very funny South Park episode.It's up there as one my favorites.The boys and all their friends find a marijuana joint left in the forest.They do not want to touch this because they have heard marijuana makes you a terrorist.This is complete BS of course, like those over the top anti-drug and anti-smoking commercials which usually lie, but the kids do not know that.Stan decides to throw it out and says nothing is going to happen.HOwever a news report comes out that a man is running around saying "It's the past".That man turns out to be Stan's future self.His future self is a bum and this motivates Stan to work harder.However he finds out that Butters has a future self as well.He thinks this is fishy and finds a motivation corp card which expires in 2002 in his walet.Stan and Butters visit and find out that Motivation Corp is where parents get someone to act as their son's future self so they can make their kid steer clear of drugs.Stan and butters now try to get revenge on their parents and make them confess.This is a really funny episode of South Park!